Yay I've finally managed to make some more pencil cases, the one I made before http://mooandmouse.blogspot.com/2011/02/beginning.html for Sophie's little friend went down well, according to Sophie she emptied her old pencil case and filled the new one straight away (I think thats a good sign). I have only done two so far but I think they are really pretty. I had some of the lovely lavender grey polka dot fabric left from the baby quilt I did ( I love this fabric I think I'm going to buy a bit more ) so I used that for the first one. I got to do some free motion again too. I managed to buy the grandmothers garden print from Buttonberry in their closing down sale, I love it, and I got plenty ( I just get it out and look at it mmm so lovely). Here they are together and I've been really efficient and listed them in the shop too. I've been really busy digging my allotment and growing lots of plants lately, hopefully I'll be boring you with some pictures soon. Sophie has been learning about the sea, boats and pirates at school this term. Today was pirate day to celebrate everything that has been learned (school is so much fun now!). I made Sophie a bandana and eye patch and she wore a scull and cross bones skirt, bit too cute to be a pirate really. We were asked to bring in some party food and I made these. Well if I'm doing pirates they're gonna be pink ! Goodness things have been a bit hectic this week, hence lack of posts sorry about that. What I have managed is to finish a quilt for a little boys Christening. I saw the post about rounded edges at http://verykerryberry.blogspot.com and I think Kerry's quilt was wonderful so I gave it a try. I love this quilt, little Harry is lucky he actually got it because I wanted to keep it and as for the corners I love them and doing them. Yet more lavender, I can't get enough of the stuff. I made a new lavender bag for the shop and had another go at free motion embroidery, I really love it although up till recently it's been a bit messy. This time I went for lettering and I can't believe how well it turned out. I keep looking at it and thinking did I really do that, it must be the calming influence of lavender. I know it's that plant again ! My first give-away, I'm really excited ( it's only a little one though nothing much ). When I was making some little lavender birds for the shop I made a few extra, so I have two prizes each one has two lavender birds one brightly coloured and one made with some liberty. The flower embellishment may vary from the ones shown, that was the main reason for extras because I couldn't decide how to do the flower, I went for beads in the end. I think the flowers took longer than the birds. Any-hoo if you would like to win, please leave a comment on this post and on the 3rd of April I will put the names in a hat/bowl and the children will pick a winner each. The twisted hazel and flowering cherry look lush at the moment, don't you think ? I loved making my Charley Harper mug rug, so I'm doing another one, I thought I would maybe have a break and do something else but I found the fabrics and had to get going. I wanted a pair for our bedroom so this time I'm doing the lavender coloured bird at the top. This is where I'm at so far. I'm feeling quite jealous as I love the colours in this one, I managed to sneak a little bit of liberty in there too. I'll keep you updated as it goes along, I've been doing this in the evenings when the house is quiet. It's a nice time to sew and because my hands are busy I don't tend to snack which is really good. Changing the subject completely it's my birthday in April and I was thinking of doing a really small give away probably one or two of the tiny lavender birds, is it too soon as I've only just started the blog ? and would any one be interested ? 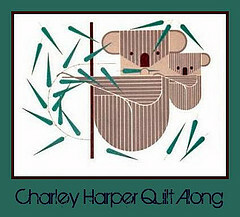 So this was the original inspiration for the Charley Harper quilt along. I've gone for the pink and purple bird first. And here is my finished mug rug for beside my bed, I had to do a little adjustment on the beak as it was too big and I just didn't like it, better now though. I really like the seed heads or though they do look a little like trees, thats ok though. 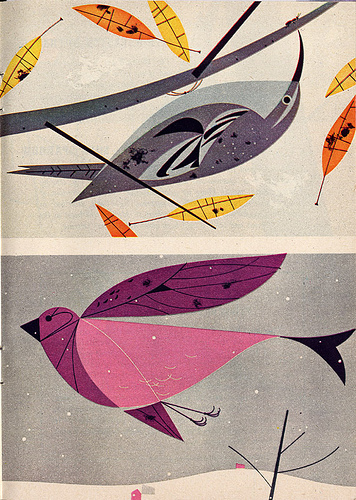 I found the seed heads on another Charley Harper picture. Here it is in situ already, just hope I don't spill my tea on it, or that if I do it washes up ok. Happy days, just got to make Woody's now. And say a huge thank you to Ethne, http://flamingstitches.blogspot.com/ for organising and thinking of such a good idea. Well thats what I'm calling them anyway. I brought this lovely bird print fabric from Emma http://emma-bagladee.blogspot.com/ as she was having a de-stash and this was one being de-stashed so to speak. I knew I wanted to make some lavender birds with it and this is what I've come up with. I really love these little birds they are really bright and summery they remind me of tutti frutti ice cream which must be really 80's but never mind. This is the piece I chose for inspiration on the Charley Harper quilt along, I love birds and the colours suit me too. I have to say I loved all the art work I looked at and it was a difficult decision. I've gone for a linen back ground, and ironed on my pieces ( so far so good ). I've hand stitched the outline, I did think about free motion on the machine, but I was scared I might ruin it. So thats how far I am and I think it's really nice. I'm going to make them into mug rugs for our bedside tables this one will be mine and the little grey bird at the top will be Woody's I particularly love the little ant on that picture. Thats the best thing about Charlie Harper's work the more you look the more you see. I was just over at http://contented.typepad.co.uk and rachel has blogged about a Charley Harper quilt along organised by Ethne at http://flamingstitches.blogspot.com, so I nipped over to have a look. Charley Harper's work is really lovely so I'm going to join in, imaging having these adorable Koalas on a cushion or quilt or mug rug. Any one can join in so if you're interested pop over to Ethne's blog for details. Hollie's school are having a dress as your favourite book character day today for world book day ( it was world book day yesterday but they are dressing up today ). Hollie decided she was going as Rose from the Magicians mask....well actually first it was a guinea pig from guinea pigs in the green house, but thats way beyond my capabilities, So....I....er....talked her into something I could manage. Luckily she already had a purple dress, so I just had to make her the mask and hair band. There was a little pattern in sew hip for these lovely flowers so I followed that and attached them to the hair band, Then made some more for the mask. She looked fab (although quite what state the dress will be in after she has walked across the muddy field to school is another story). I'm thinking these flowers would make a lovely little brooch for my coat or bag and they were such fun to make, they may start appearing every where. Little moo is five today, oh my goodness how quickly time flies. I would love to say I made this cake but sadly that isn't the case, I ran out of time ( owing to the fact I was up till 10:20pm icing biscuits for her to take to school ). Just look at that little bunny isn't she adorable. I did pipe her name and age on though and considering how much my hand was shaking I think it looks ok, much neater than my hand writing anyway. When we went away I took some supplies with me, this is what I did. Definitely going to be a pin cushion, only thing is it's a little baggy and there are tiny holes where I sewed the fabric to the hexagon. Other than that I like the colours and the embroidery, hopefully when it's made up it will be ok, Practice needed I think. Thats it for today, I haven't been very productive recently, sometimes it's just like that I guess x.